The Best of Teacher Entrepreneurs III: FREE SOCIAL STUDIES LESSON - "Economic Causation Cards"
FREE SOCIAL STUDIES LESSON - "Economic Causation Cards"
Causation Cards are the newest and next best thing since task cards! 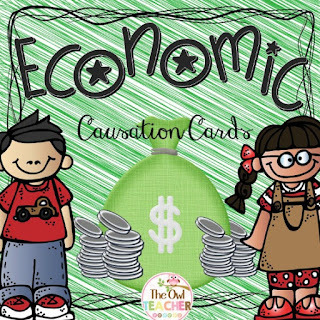 Causation cards are a fun, interactive way to review vocabulary and concepts that students need to learn. In addition, this engaging activity helps improve fluency and listening skills. So how does causation cards work? The method is similar to the “I have… who has…” cards, where each student has to listen carefully to other students to know when it is their turn. However, causation cards do not contain a repeated language (like “I have… who has…”). Instead it will state an action that a student must perform and a statement they must say. The action can be something simple from jumping in the air to drawing on the board. The statement can be a definition of a term or related concept. This activity is a great resource for practicing those all important speaking and listening skills while building fluency. This resource is a great way to improve student's reading accuracy, prosody, and fluency rate. Have the class read through the set of cards multiple times giving each student a different card each time or read to each other by taking turns. You can find this fun, interactive FREEBIE by clicking here. I have many causation cards in my store - and am continuously making more! You can follow my store here to be up-to-date on all my new products! Click here to see the various causation cards I have available!